Kanojo to Kanojo no Neko was published in English as She and Her Cat by Vertical Inc. under the Vertical Comics imprint on August 1, 2017. This manga may be short but it packs a delightful punch. Told from the perspective of a cat named Chobi, he is a stray picked up by a woman called Miyu and given a new home with her. This quick and simple read takes you on a slow ride through the seasons as Miyu and Chobi quietly live together. Because only Chobi's thoughts are shown, it provides another element to the story that isn't usually present. While we still get to see what Miyu says, we don't get a look inside her head and rely on Chobi to tell us his opinions of Miyu. It's a refreshing way to see a story, and any cat owner will be able to see some parallels to their own life. It's very down to earth, and no matter who reads this they will definitely find little bits that they can connect to. Take an hour out of your day and give this a read- you won't regret it. A delightful little manga about the life a single, 20-something Japanese woman as seen through the eyes of her cat. At first I thought this was a manga original, but after doing some digging apparently the first version of this story was a 5 minute short film Makoto Shinkai made back back in 1999 before he'd hit it big as a director. Now with a few movies under his belt (perhaps you've heard of them, he made this little film called 'Your Name' which seemed to get some attention last year) Makoto Shinkai is revisiting his roots with a four chapter manga adaptation. 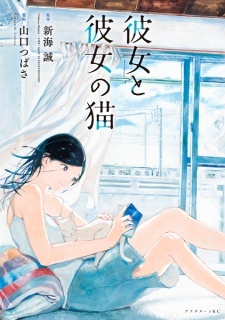 If I was being cynical I'd say the reason this manga adapation got an English print release by Vertical Comics despite previous versions of this story going largely under the Western anime radar was because after 'Your Name' made $350,000,000 and Makoto Shinkai officially became frontrunner for the title of 'The Next Miyazaki' (before Miyazaki came back out of retirement again) they figured name recognition alone would move copies regardless of quality. Makoto Shinkai being Makoto Shinkai, however, this short story has plenty of quality. It's not long by any means, but She And Her Cat manages to really capture the feel of the confusion and anxiety of early adulthood, when a lot of life is in flux, you're making big decisions with limited experience and information, and there's the constant pressure to 'figure things out'. It's short, sweet, and doesn't overstay its welcome. The art is quite lovely. When colors are used, artist Tsubasa Yamaguchi went for a blue pallet that gives the images a soft but vaguely melancholy feeling. Most of the backgrounds consist of various shots of the apartment of Miyu (She) and Chobi (Her Cat, and the point-of-view character), since Chobi rarely leaves home. Telling the story from the cat's perspective is a clever little storytelling trick as it both provides information (we the audience have an 'excuse' to be inside Miyu's home where she let's her guard down and shows her true emotions) and witholds information (Chobi obviously can't read Miyu's mind, so we the audience have to piece together what's going on with limited clues). Miyu is drawn quite well, giving off a wide variety of expressions that are crucial to developing her character. For some reason I always imagine Chobi as having a French accent. If I had to guess it would be because he reminds of the titular character of the French animated film The Rabbi's Cat with the way he talks about his female owner as if she were his lover or mistress (although he's not quite as snarky as his French counterpart). Anyway, getting back on track, while Chobi is a straightforward character with little progression over the course of the story, he's critical as almost all of what we see is what he sees, and he's the only character whose mind we can get inside. Miyu is quite well done as she shows rather than tells what's going on in her life. There are only two other characters with a name and face- a college friend of Miyu's and a kitten named Mimi who Chobi quite openly admits he's only involved with for the physical benefits as all his affection and devotion are for Miyu. Well, at least he's honest. The characters are developed quite well for a short 4 chapter manga. This is an enjoyable short read that shows once again Makoto Shinkai's excellence in emotional storytelling. As a cat lover and husband of a going-crazy cat lady (I love you, hon. ), this manga jumped off the shelf at me. When I opened it I did not know what to expect, however I was very much pleasantly surprised after reading through it. 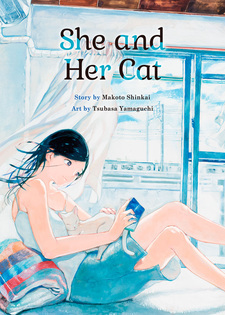 This manga is a one-shot that tells the story of Chobi, a house cat, and his relationship with his owner, Miyu. The story is told completely from Chobi's perspective, which sets it apart from most other stories of its kind. Through Chobi's inner monologue you get to discern what type of cat he is as well as the sort of owner Miyu is for him. You see Miyu live her life through Chobi's eyes and experience her daily dealings as they're understood by him. Though there are some heavy emotional moments, the story can come off a bit humorous simply because of how Chobi understands the things that Miyu does. It's a story that stays with you to the very end. I really enjoyed this one-shot because it provided a different look at the relationship between pets and their owners. I empathized so much with the story that it showed just how easy it was to get involved. The artwork is simplistic, yet expressive. All-in-all it's a great read and I definitely recommend it.